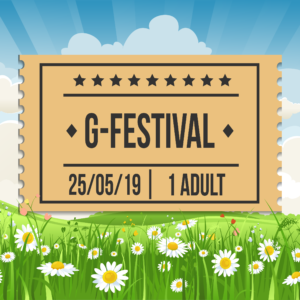 All tickets purchased will be available for collection on arrival at G-Festival. Please ensure you bring a copy of your PayPal receipt so that we can provide you with your tickets/wrist band. We cannot provide your entry tickets without a valid proof of purchase. Children are welcome at G-Festival. Children under 3 are free. Children over 3 to 17 are £2 each per day and will receive 2 complimentary refreshment tokens. All children must be accompanied by an adult at all times.